This page in a nutshell: An ancient tradition lies behind the traveler’s welcome in Greece — and it is a tradition that was fundamentally religious before it became a part of social custom. Zeus, the king of the gods, demanded that strangers be treated graciously. Hosts had a religious duty to welcome strangers, and guests had the responsibility to respect hosts. 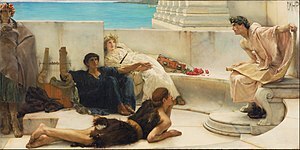 The tight interconnections and mutual respect in this host-guest relationship are reflected in the fact that the word zenos in ancient Greek can mean both “host” and “guest.” The relationship is often symbolized in the Odyssey by the presentation of gifts. Alcinous, the king of the Phaeacians, for example, gives Odysseus a magically swift ship to get him home. What happens when the host-guest relationship is abused or otherwise breaks down? In Homer’s epic songs of the Trojan War, the Iliad and the Odyssey, this happens at least three times. The first occasion caused the war itself: Paris, prince of Troy, ran off with the beautiful Helen from Sparta while he was a guest of Helen’s husband, Menelaus. For the Greeks, this insult to xenia (hospitality) was at least as serious as Helen’s unfaithfulness, and it meant that Zeus would, in the end, allow the Greeks to triumph in the long war. The second example of violated hospitality has its humorous and ironic side. In the Odyssey, the Cyclops is monstrous not only because of his huge size and brutish appearance. He is set apart from civilized beings precisely because of his barbaric outlook on xenia. When Odysseus begs the Cyclops for hospitality and warns that Zeus will avenge an injured guest the Cyclops replies that he and his kind “care not a whistle for . . . Zeus.” With dark humor, the Cyclops uses the word xeineion (Greek for “guest-gift”) when he tells Odysseus that he will have the privilege of being eaten last. The poetic justice of the Cyclops’s blinding would not be lost on Homer’s Greek audience. ↑ Written on December 29, 2013. This page was last edited on 22 January 2019, at 17:51.